The Gowanus Lounge: Will the Freakenspeile Tower and Bizarre Bazaar Come to Coney Island? Will the Freakenspeile Tower and Bizarre Bazaar Come to Coney Island? The Coney Island presentation made by developer Joe Sitt and by Thinkwell Creative Director Chris Durmick about Thor Equities Coney Island plans contained a number of new details. The presentation leaned heavily on the designs for Stillwell Avenue, the Bowery and a passage that has been dubbed Front Street as well as Coney Island Park. (The latter would replace Astroland.) It avoided mention and depiction of the hotels and time share buildings up to 40 stories in height and with nearly 1,000 rooms and units that would rise west of Stillwell Avenue. Mr. Durmick, whose firm has been hired to design the project, chafed at comparisons that have been made to a "Las Vegas theme park." He said the firm was designing an "amusement park" and that "it must be authentic Coney Island. Every theme park in the world has a pedigree that's Coney Island." Mr. Sitt himself several times said that "We're not just building a fairytale garden." He described the product as "urban, New York and Coney Island." In its latest iteration, the plan would divide the amusement area into several "neighborhoods." Stillwell Avenue would serve as its main retail area. 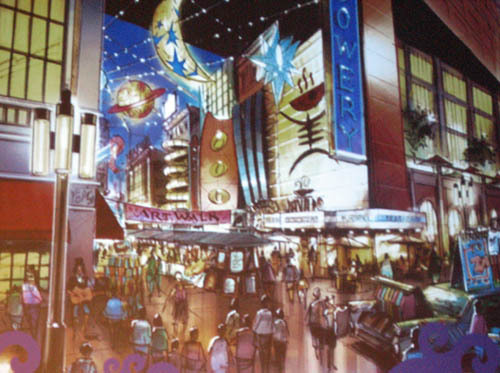 It will have an "Emporium" where visitors can buy tickets, burn photo CDs and rent lockers and strollers. It will also have "a vertical dark ride." There will be a giant elephant fountain outside. The feature sure to provoke discussion, however, is the planned Freakenspiele Tower ("Freakenspiele" is one of the few words that you can Google which will produce zero results.) The tower will have 40-foot LED screens on all four sides and a "launch tower ride" in the interior. It would be at the boardwalk end of Stillwell Avenue. Halfway down Stillwell toward the boardwalk, the developer plans a performance plaza. A glass-enclosed water park would be six stories above street level. In this vision, Stillwell avenue would be transformed into a "walking promenade" with street performers, bistros, shopping and a multiplex theater. The tall buildings on the west side of Stillwell Avenue would have street fronts of four-six stories, but would rise up to 40 stories. Mr. Durmick mentioned there would be another roller coaster in this vicinity, an "overhead steeplechase" that would be a high-speed launch roller coaster. The Bowery (previously unpublished rendering above) was described as Coney Island's "subculture suburb." "This place wants to be designed by the local people," Mr. Durmick said. "This is where the circus sideshow people would live." The would include a high tech "Vertical Fun House" and something called the "Bizarre Bazaar," which was described as a "sub-culture souk." We're not sure what a sub-culture souk is, but it sounds like it might be an attempted recreation of St. Mark's Place in the old days. The final element described by Mr. Durmick was Coney Island Park, the project that would replace Astroland. It would be an indoor-outdor park with 21 rides on multiple levels. It would include old school rides like the Tilt-A-Whirl as well as a new roller coaster called the Leviathan that is envisioned as looping through buildings and under the boardwalk. It would also include a 120 foot tall Aviator tower ride. W. Tenth Street would become a pedestrian area. "We want to create a whole menus of neighborhoods and flavors because this is Coney Island," Mr. Durmick said. 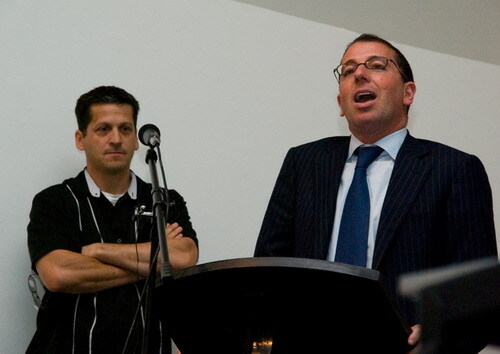 The photo below, which is courtesy of Adrian Kinloch of the blog Brit in Brooklyn, shows Mr. Durmick on the left and developer Joe Sitt at the podium on the right.